Seattle prices fall sharply. New York condo prices nearly flat for the year. 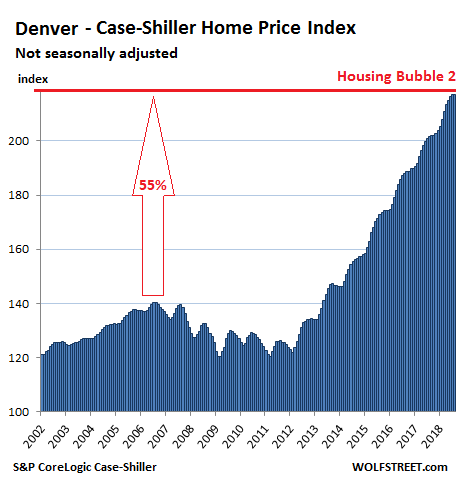 First feeble declines in San Francisco, Dallas, Denver, etc. Something is afoot. 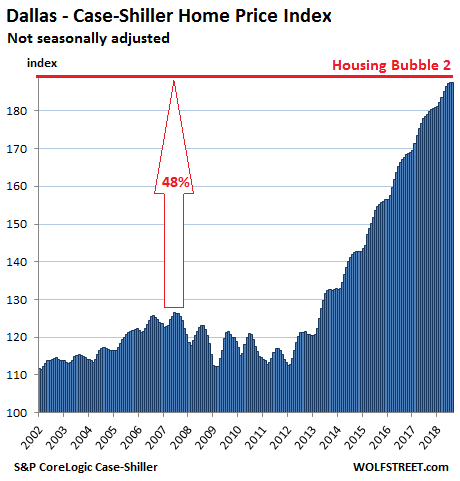 The Case-Shiller Home Price Index lags behind by design. It is a rolling three-month average; today’s release is for June, July, and August. 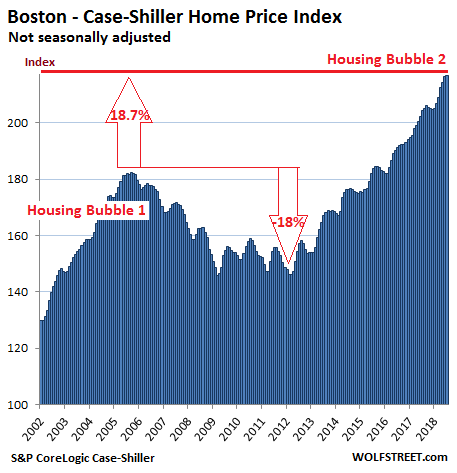 The index is based on “sales pairs.” It compares the sales price of a dwelling in the current month to the last transaction of the same dwelling years earlier. The index incorporates other factors and uses algorithms to arrive at each data point, but it does not provide dollar-price levels, as a median price index does. The index is focused on single-family houses but has some special sub-indices for condos. It was set at 100 for January 2000; an index value of 200 means prices as figured by the index have doubled — which they have for nearly all metros on this list. 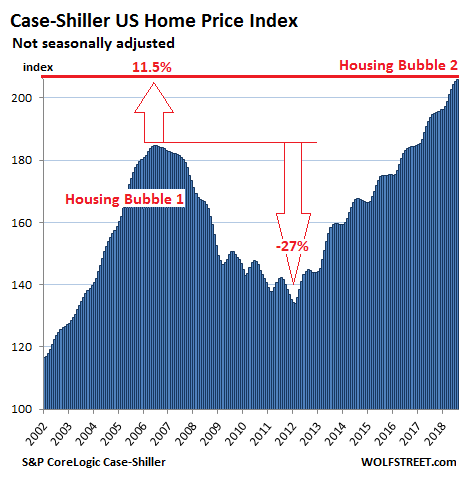 The index is not inflation adjusted but is itself a measure of inflation — not of consumer price inflation but of asset price inflation, specifically housing-price inflation. It shows to what extent the dollar is losing purchasing power with regards to buying the same dwelling over time. 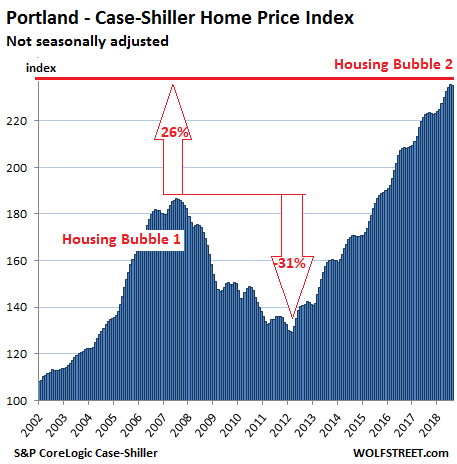 For a few months now, we have seen the first indications in some of the hot local housing markets that fundamentals are deteriorating: Declining sales, rising inventories, increasing number of days on the market, and the like, though their prices as measured by the Case-Shiller Index hadn’t turned. 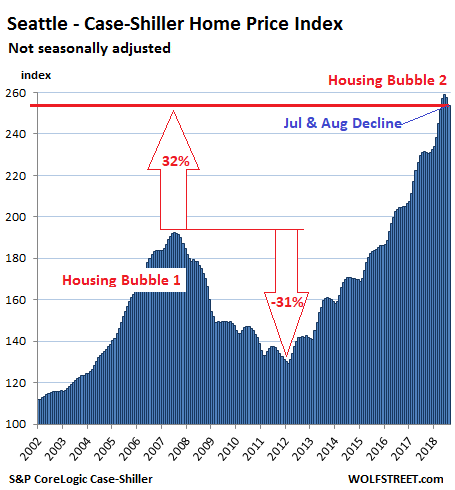 Seattle was one of them, but now prices are decidedly turning in Seattle. 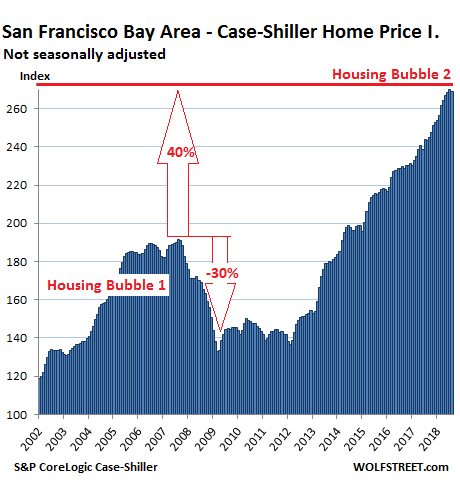 Condo prices for the five-county San Francisco Bay Area, which the Case-Shiller index tracks separately, follow a similar trajectory as house prices, except they have now declined for the second month in a row on a monthly basis, and are back where they’d been in April 2018. 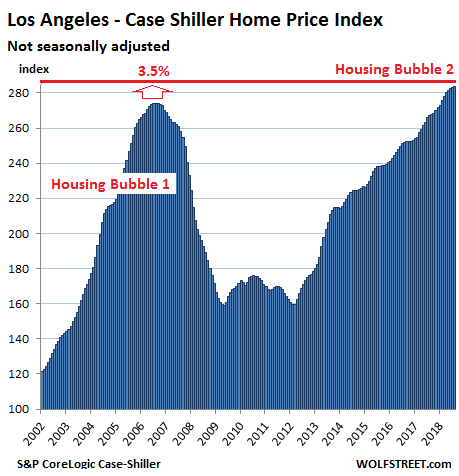 The Case-Shiller data covers other cities that have not yet reached prior bubble highs, such as Miami and Las Vegas, and so these cities don’t yet fit into the theme here of the “Most Splendid Housing Bubbles in America.” Some day they might. But by then, the index for some of our lead contenders here might already be heading south. 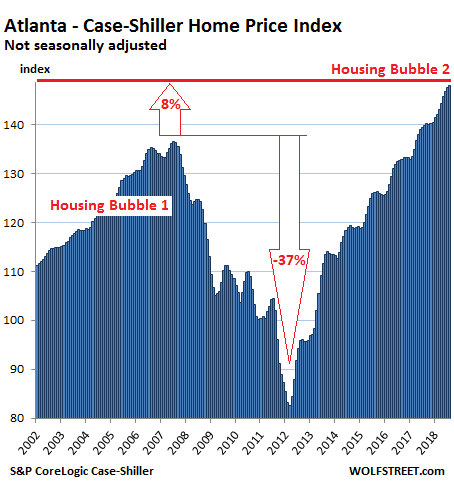 And this would be typical too: during Housing Bust 1, prices in some cities turned in early 2006 and in others in the latter part of 2007. 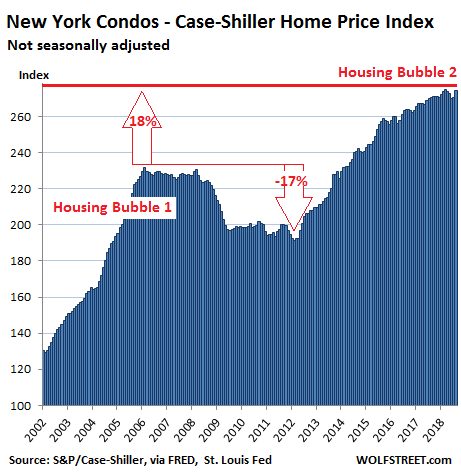 However, there are many equally or even more splendid housing bubbles in cities that the Case-Shiller data does not cover, such as the blisteringly hot Nashville metro. So these cities cannot be included here. We miss their continued absence.